This page was written on a system configured for 800 x 600 SVGA display and 24 bit Colour. Viewing on a system with smaller screen size (e.g. 640 x 480) may result in tabular information not being rendered as intended and less than 24 bit colour capability may adversely affect the rendering of photos and scanned images. At the time of writing, commencing in August 1999, Life Like have not long ago announced their forthcoming 'torpedo boat' GP7 which is visually very similar to the SP 5623 except for the usual spotting differences between a GP7 and a GP9 and maybe some 'phase' differences. I have a feeling in my bones that they may well offer a passenger GP9 in the future but I have decided to proceed with this conversion of a GP18 which I have been planning and collecting parts for for some time. If nothing else this decision may hasten the release of a commercial passenger GP9 in accordance with 'The Dabney principle'. 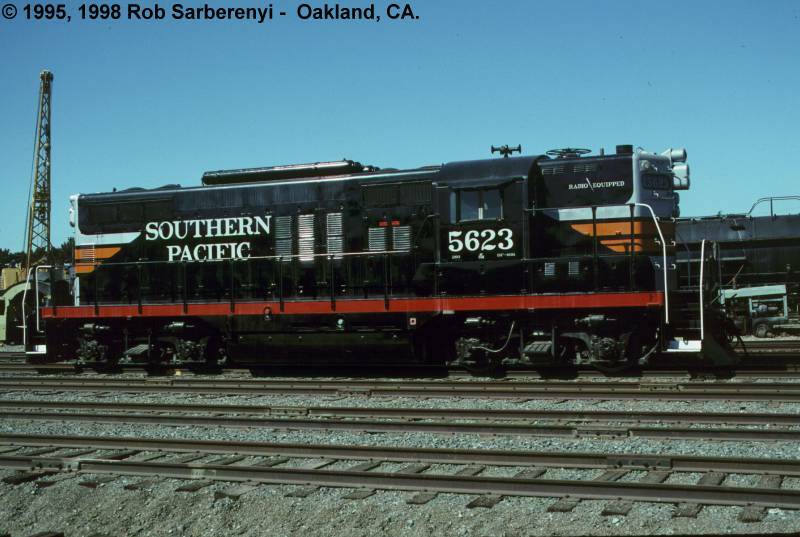 SP 5623 in Black Widow livery as running in 1956. Link to image of preserved 5623. This locomotive having been preserved in a condition very similar to 1956 means that plenty of photos are available for detailing purposes. That fact also means that care is necessary in finishing the model since it is a relatively well known and easily recognised prototype. Choose from the following topics . . . . .